Today’s Libra New Moon happens in a conjunction to a galaxy called M87. Astrology usually depends on planets, other bodies orbiting the Sun, and some fixed stars within our own galaxy. I would say only a minority of astrologers use fixed stars — they seem to be less popular than they were a few hundred years ago. Yet thanks to prolific book publishing and the Internet, information is easy to find, and they are starting to come back into favor. 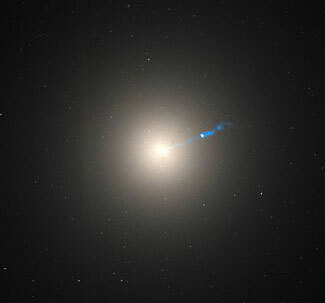 M87, photographed from the Hubble Space Telescope. There are other kinds of fixed points as well, called deep space points. These include quasars, pulsars, black holes and galaxies. There are a lot of these things to go around. Fixed stars and deep space objects don’t move like planets, in relatively fast orbits around the Sun. Rather, they do what is called precess. They only appear to move because the Earth wobbles on its axis — a long, slow wobble lasting about 26,000 years. This morning, the New Moon is conjunct one of those points — a massive galaxy called M87. The M stands for Messier, that is, Charles Messier, a French astronomer who discovered and cataloged it in 1781 as a nebulous feature rather than as a galaxy. It’s also known as Virgo A or as NCG4485. We do not know what the entities there refer to their home as. It’s located 56 million light years from Earth. That means it would take 56 million years traveling at the speed of light to get there. A galaxy is a new concept, not well-developed by astrology, though a scattering of astrologers are paying attention. In my experience, M87 carries momentum. I think of it as adding velocity and the sensation of weight. I consider it a force to be reckoned with and treat it with respect when I see planets align with it. One of its distinguishing features is an ejection of energetic plasma extending 5,000 light years into deep space. The New Moon aligned with this point takes on that characteristic. A New Moon in early Libra is emphatic as it is, happening early in a new season and closely opposite the Aries Point (the very beginning of the zodiac — Libra is the halfway mark measuring the Earth’s annual trip around the Sun); there is already lots going on right at this spot — and the season is ready to roll. The presence of M87 just turns that up. But the thing is, most people don’t know about it. So looked at one way, the person reading the aspect needs to point this out, because it’s subtle until you tune into it and get the message. You can think of this New Moon as the Taskmaster — the one who gets the job done. The one who takes initiative. The one who builds the team, gets the collaborators and becomes the next person to shape the world. Shaping the world one being at a time ~ Thanks Eric. Your insights are creating the change! Thank you, Eric, for adding yet another dimension to the depth of this year’s Libra New Moon.